EDC systems can either be standalone databases on a desktop computer/server supporting a single site or they can be Web based with the ability to support multisite studies [1, 3, 27]. Based on the business model utilized and the licensing-distribution method followed, they can be broadly categorized as commercial and open-source EDC systems. 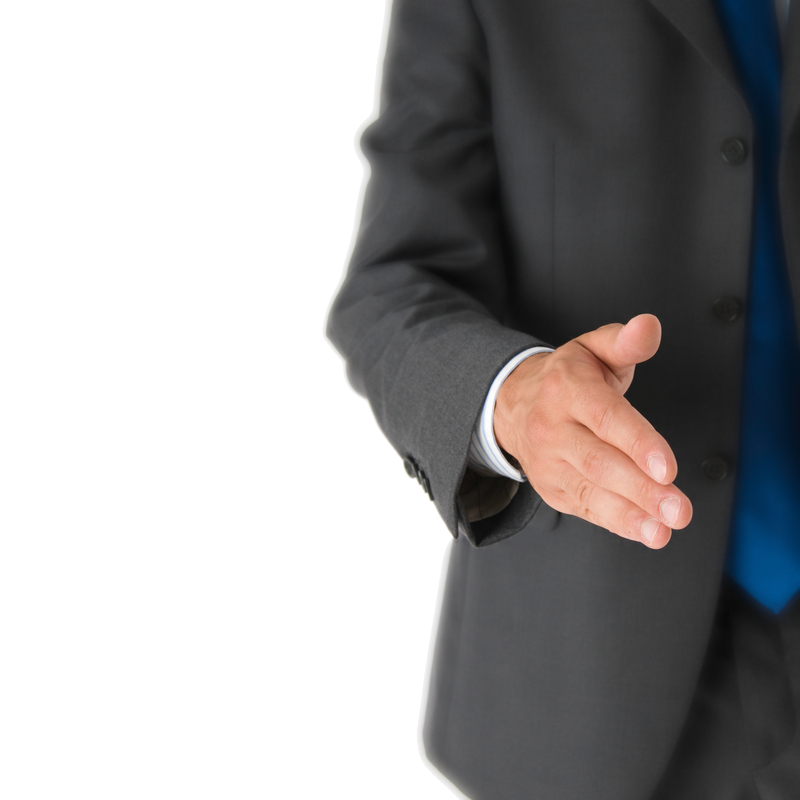 Commercial EDC applications are usually developed by a for-profit company or developer group. They charge for user licenses with or without annual support contracts while the source code is not published. Some examples include Oracle® Clinical (Oracle, USA) , Clinsys® (Jubilant Organosys, USA) , InForm™ (Phase forward, USA)  DATATRAK Electronic Data Capture (DATATRAK, USA) . On the other hand, free and open-source software are applications developed by a single or group of developers, often as a voluntary effort. The application and its source code are published online and users can download them without any cost. Some examples include DADOS P (Research on Research group, Duke University, USA)  OpenClinica® (Akaza Research, USA) , Redcap (Vanderbilt University, USA)  and TrialDB (Yale University, USA)  . Commercial EDC systems can either be purchased as a software package or through a license with periodic support either included in the package or charged separately. In some cases, users have to pay a one-time license fee while in other cases users can renew their license periodically. Troubleshooting and guidance are usually provided under support plans while bugs in the application are rectified and released under regular updates. Commercial EDC applications are usually easy to use in light of the quality of documentation and customer support extended to users. Well-designed interfaces are responsible for their user-friendly design. Multiple levels of user access, security, adherence to industry and regulatory standards, support for the design of eCRF’s, data entry, and management are features common to many commercial EDC applications. Some of them may also be able to generate reports, for example, DATATRAK One™ (DATATRAK international Inc, USA) , Entrypoint Plus® (Phoenix Software International Inc, USA) , and CliniProteus (Roskamp Bioinformatics Core, USA) . Although standalone EDC systems are prevalent, they are increasingly being offered as a part of a complete clinical trial management system (CTMS). For example Oracle Clinical and InForm are offered as a part of a larger CTMS. Despite the benefits, commercial EDC systems are expensive  and frequently non-customizable. They have been considered inadequate in context to the needs of healthcare stakeholders (clinicians, administrators, and patients) . Given the variety of clinical practices and research methods used, commercial EDC systems may not fit into the workflow at each clinical/research site, thus having implications on their effective and efficient use. Many of them do not support interoperable data standards, i.e. it may not be possible to merge data exported out of one EDC with data exported from another EDC system or research/clinical application. As a result data from multiple studies or sources cannot be merged and utilized for answering research questions. Since the source code is not released, users must depend on the developer group or vendor for customization and support-related requirements. This limitation is frequently referred to as “vendor lock-in,” which makes further development and maintenance of commercial EDC an expensive effort. We reviewed the web to identify some of the prominent and popular commercial EDC systems. They include Oracle® Clinical, InForm™ and Rave® (Table 1). Among themselves they hold a larger share of the EDC market . 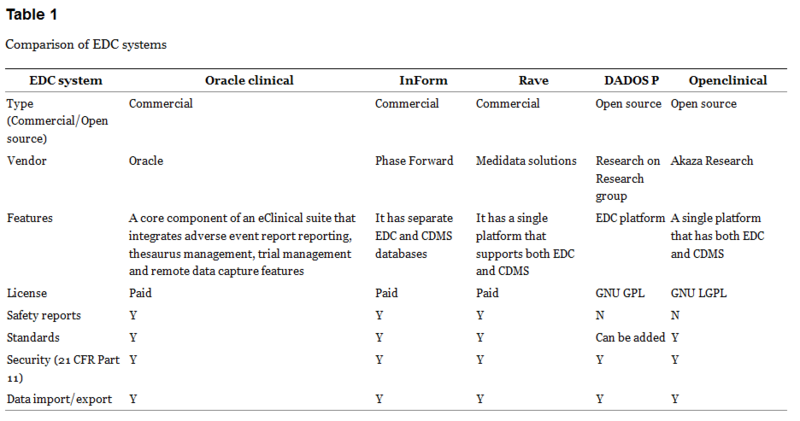 Other examples include DATATRAK and eTrials EDC (Merge Healthcare) [8, 11]. Oracle® Clinical  is a commercial EDC system for conduction of clinical studies and trials. It is a core component of an integrated eClinical research solution that integrates adverse event report reporting, thesaurus management, trial management and remote data capture features in a single application. InForm™  global trial management system delivers a variety of features essential for the effective and streamlined implementation of clinical studies and trials. It sports an impressive study setup page, scalability and has separate EDC and CDMS databases. Other features include an intuitive interface, streamlined workflow, reporting and analysis tools that help the study team to work more efficiently. It can also be seamlessly integrated with randomization, trial design, and medical coding modules. The Rave® (Medidata solutions)  platform is another industry leader in EDC systems. It has an impressive study design tool that nullifies the need for programming skills. It offers a single, flexible and scalable platform that captures, manages and reports clinical research data. It also undertakes a balanced approach between ease of use, features and functionalities. It has the flexibility to interface with legacy systems, adheres to CDISC clinical data standards and sports a plugin for modifying the interface and functionality. DATATRAK Electronic Data Capture has considerable market presence . Its features range from patient data management, electronic forms, supports queries, alerts and visit scheduling and generation of custom reports. It is also equipped with custom checklists and workviews, configurable tools for data cleaning, real time statistical support and an integrated medical coding package. eTrials EDC  is a web based application that collects, manages and analyzes clinical trial information in real time. It is a user-friendly yet robust application with an in-built workflow. It can generate reports and can easily integrate with data from other applications. Despite being feature rich, scalable, secure and compliant to industry standards, these EDC systems are prohibitively expensive , thus limiting their use by individual investigators and users from developing countries that do not having adequate funding but are interested in research participation. Open and freely available source code released under open distribution licenses like general public license  is the defining feature in this category of EDC systems. Open source code generates a large community of users and developers that interact, modify, and enrich the source code over a period of time and report bugs and solutions, thereby enhancing the quality, features, and value of the EDC system. In order to sustain an open source license, developers usually charge for customization requests. The same is applicable to troubleshooting and support, which are usually delivered through a yearly contract or support plan. Thus, by providing free access to the source code and annulling restrictions on use, modification, and distribution, open-source EDC systems form an attractive alternative for users. The availability of inexpensive (or free) open source EDC applications for individual physicians/researchers, departments, and institutes has the potential to improve clinical and research activities and enhance academic standards by reaching a wider audience. Since further development/customization and ownership costs are lower, institutional administrators can modify and adapt open-source EDC systems to suit their environment and workflow, thus ensuring the success of EDC implementation. User-friendly and simple interfaces, adherence to industry standard security protocols, customizability, interoperability, and low maintenance costs are some of the major benefits of open-source EDC systems. Additionally, the presence of user support groups and communities ensures continuing support. Although open-source EDC systems have a unique mix of features, their adoption in healthcare organizations has been slow. Software cost and maintenance are not the only features that influence decision makers. For an institution/organization-wide implementation, decision makers usually prefer and opt for EDC systems that are easy to deploy, manage, and support. Not all open-source EDC systems qualify for the same. In addition, dependence on the developer community for support and updates may cripple the organization if the community stops being productive. It is possible to address this issue by hiring programmers who could work on further development and maintenance, But locating and training relevant workforce is a challenge as in many cases the background technology has a steep learning curve. DADOS Prospective, OpenClinica® and Redcap are examples of open source EDC systems. DADOS Prospective is a Web-based application developed by the research on research group (RoR)  to support data collection activities among researchers, research groups, and research networks . It enables users to replicate any case report form into an eCRF, collect data in single/multisite studies, and extract data in an interoperable format. It is compliant with Chapter 11, Title 21, Code of Federal Regulations  and Health Privacy and Accountability Act (HIPAA) guidelines for EDC. It can be used to streamline and support individual/departmental/institutional databases, registries, and single/multisite clinical/nonclinical studies and clinical at a low cost . OpenClinica®  is an open source application that has both EDC and data management capabilities. As an EDC system, it not only facilitates collection, validation, and annotation of clinical data but also has features that allow study audits, reporting and data extraction. Research electronic data capture—‘Redcap’ is an open source metadata driven application designed for the clinical and translational research target audience by Vanderbilt. Its features include: a streamlined process for building a database, an intuitive and secure data collection interface that supports data validation and automated data export in multiple formats. It also supports other advanced features such as branch logic and file upload. It is freely available to its consortium partners with a modest personnel investment of < 0.5 FTE that covers training and support activities [16, 34]. In less than 7 minutes we show you how to build a basic study in OpenClinica, so you can experiment.